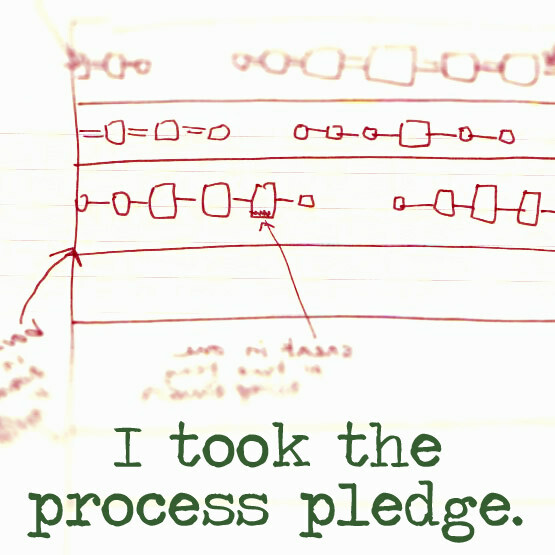 I, Liz, pledge to talk more about my processes, even when I can’t quite put them in the in words or be sure I’m being totally clear. I’m going to put my thinking and my gut feelings out there. As I'm sure you've noticed, my last post was more than a month ago. I've been working, although truthfully not as much this month, but I started this blog to help me complete UFOs. If I'm not keeping the blog updated, it may mean the UFO pile is only growing, the WIP pile is shrinking and the completed projects are not making any new friends. So I hereby pledge to post at least every other day. Even if only to say hi, and that I'm shirking on projects. For the actual completion of projects? Well, DH will be on night shift ALL month, which means any night he's not at home is a night I can freely spend at the sewing machine without feeling like I'm ignoring him. So here's to a new start. See ya soon!